The following airports are in the area around the San Francisco Bay, including the cities of San Jose, San Francisco, and Oakland. 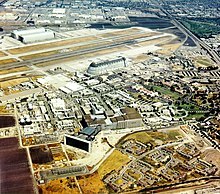 The list includes only public-use and/or government-owned airports in the eleven counties (the nine counties that border the bay, plus Santa Cruz and San Benito Counties) that make up the Census Bureau's San Jose–San Francisco–Oakland, CA Combined Statistical Area. The Bay Area has four airports with airline service. The following airports are operated by the federal government and are not open to the public. These airports have Class D airspace. The following General Aviation airports have enough traffic to have an air traffic control tower. These airports have Class D airspace. The following airports do not have control towers, but are listed by their owners as open to the public. Pilots announce runway and airspace usage via radio contact. These airports have Class E airspace for those with an FAA-published instrument approach procedure, or Class G airspace otherwise. This page was last edited on 23 February 2019, at 04:49 (UTC).